Hospice is a concept of care that focuses on quality of life for those with a life expectancy of six months or less if an illness runs its normal course. 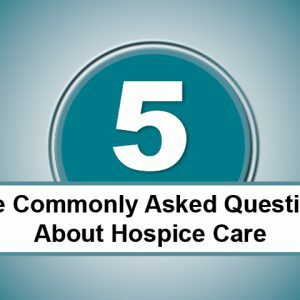 Many people are surprised to learn hospice is available for weeks and months of care. Even though this benefit is available, many people do not start hospice services until the last week or days of their life. Hospice is not intended for just the last 48 hours; rather, hospice care is meant to accompany and support you and your caregivers through this chapter of life. There are many benefits for both patients and their family members of considering hospice care earlier on in their terminal illness rather than waiting. 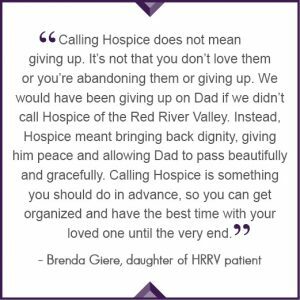 After years of experience working as a Hospice of the Red River Valley nurse, I have heard countless times from patients’ family members that they wish they would have called us sooner. One of the most beneficial reasons I encourage families to call Hospice sooner is so that the patient and family can develop a relationship and comfort level with one another. Hospice offers a multidisciplinary team of professionals, including a hospice physician, nurse practitioners, registered nurses, licensed social workers, certified nursing assistants and grief specialists—who all come together to care for patients and their caregivers through the final journey. Each member of the team has a distinct role in supporting the patient and family, and the team works together to help achieve patient-centered goals. This is a sacred time in life, and the Hospice team works to help individuals live well until the end, which means focusing on their wishes. 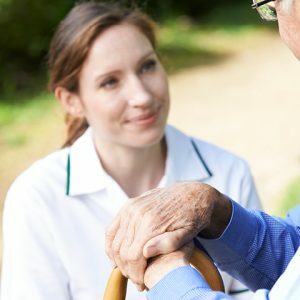 I have witnessed the fulfillment of many of our patient’s goals during my time at Hospice of the Red River Valley, including seeing a loved one again, writing a final will, creating notes to be read when they pass, documenting the details of their life and creating special moments with friends and family. Hospice care also focuses on managing a patient’s pain and symptoms, while bringing sensitivity, compassion and skill to meet the individual’s needs and support for their loved ones and caregivers. With an emphasis on comfort rather than curative treatments, patients spend less time at the clinic and hospital, and more time at home, surrounded by loved ones—all while maintaining control of their schedule. When pain and symptoms are relieved, the anxiety and stress that may accompany a terminal illness are lessened, too. In some instances, getting symptoms under control can actually help people live longer than they otherwise would. Another important aspect of hospice care is providing education to the patient and family about the dying process. The support and education begins the same day services are started and continues through end-of-life. This time in life can be overwhelming, especially when you’re already dealing with a myriad of emotions. Processing the emotions and coming to terms with death takes time, and more opportunities for the patient and family to connect with the Hospice team can lead to a gentler transition. Additionally, the Hospice team helps caregivers through emotional support and hands-on care of their loved one, which reduces the chance of caregiver burnout. There are many additional benefits to understanding all of the available health care options for you or your loved one. Being knowledgeable about your choices can provide peace of mind and allow you to make the best informed decision about your or your loved one’s end-of-life care. If you have questions about hospice care, Hospice of the Red River Valley can help. When you’re ready to learn more, contact us. We’ll visit with you at a time convenient for you, free of charge. If hospice care is right for you, we will do the follow-up work, including contacting your doctor, starting the necessary paperwork and arranging a visit with a hospice nurse. 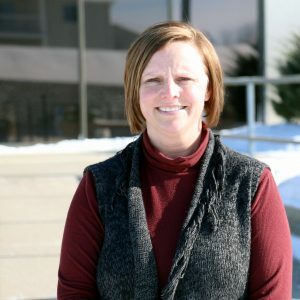 Kelly Haneca is a registered nurse with Hospice of the Red River Valley.